The known world of Morandia comprises two great continents, Erentis and Numinon, divided by nine nations. The western continent of the known world is most often called Erentis. The bulk of the continent is taken up the Empire of Somana, which also includes the sometimes-distince region of Ierusca and the Kingdom of Pentaros, which is currently in a state of rebellion. Two separate nations also exist on Erentis, the Kingdom of Heiland and Elwynd High. Click on a banner below for more information on each nation. Numinon is the Eastern continent of Morandia, and is also usually assumed to include the Northlands, an archipelago to the north of Numinon. Kelmantium is the dominant nation of Numinon, and in fact once included all of Numinon and the majority of Erentis. 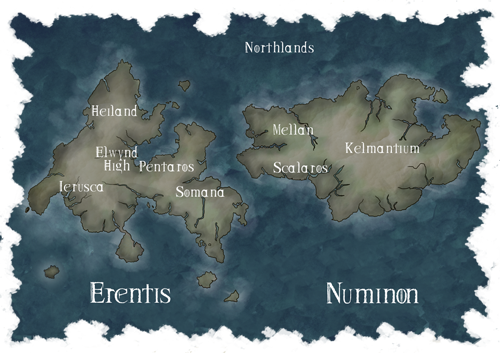 The Kingdom of Scalaros occupies the southwestern portion of Numinon, and the Freeholds of Mellan the northwest. For more information on each of these nations, click on the banner below.